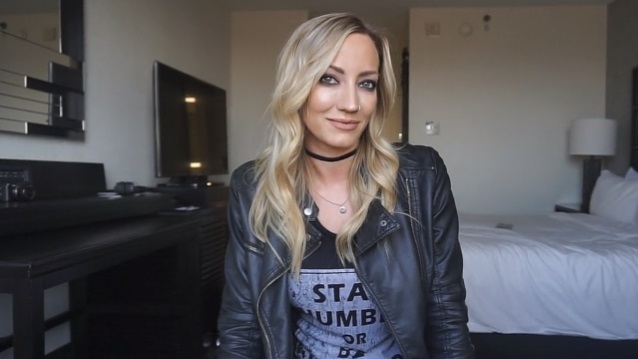 Kris Englehart of Backstage Axxess recently conducted an interview with guitarist Nita Strauss (ALICE COOPER, WE START WARS) about her forthcoming debut solo album, "Controlled Chaos". You can listen to the entire chat below. A few excerpts follow (transcribed by BLABBERMOUTH.NET). Nita: "The Kickstarter, it's such a cool thing because as a guitar player that's made my name as a hired gun, I wasn't really sure how the response was going to be for me doing a solo record, just completely on my own. You have that feeling of, 'Do people like me for me? Do they like me because I play guitar for someone else they like?' So, to see the response to the Kickstarter, and to see people actually really want to see, hear what I'm doing, hear what comes out of my own mind, is really an incredible experience. I'm just excited to get started on it. The campaign completely blew my expectations out of the water. At this point, it's really a preorder. We have the funding we need to do the record now. At this point, it's kind of just a preorder with some awesome perks, some awesome bonuses for people. I signed an Ibanez guitar, like the one I play, pizza night with me, or even just a signed copy of the record or the record on vinyl. It's becoming a really fun journey." Nita: "That's the hugest part and really the main reason why I did it this way. Again, it goes back to I spent most of my career playing other people's music and doing it the way they wanted it done. So, as I step out and take these first steps on this journey to do my own thing, I didn't want to have to get anybody's approval on anything. I didn't want to have to ask a record label 'Is this okay for the album cover? What time do you think I should go on tour this year?' I wanted to make this record on my own terms and do it the way I wanted to do it." Nita: "Yes, I have actually just got the routing for the solo tour that we're going to do at the end of the year. Of course, my touring schedule with Alice always comes first. I can't quit my day job. [Laughs] So, I will be out with Alice for most of the fall and the winter, but, we do have some dates opening up and the first run of solo dates in the U.S. is shaping up very nicely and then it looks like we're going to do Europe for a solo run early next year." Nita: "I cried for about two weeks. [Laughs] My mom saw it in the grocery store. She didn't go to find it. My mom just saw in the aisle in the same store she's been going to for 20 years. I saw it in a Barnes & Noble. It really is an amazing feeling. Yes, of course, I've been dreaming about it since I was a kid. Even now, I'm 31 years-old now and I've never been on a cover of a magazine. It makes you feel in such a way to do it with my signature guitar and to have it be Guitar Player magazine, it was really just an amazing experience." Nita: "The Alice Cooper tour, this time around, we are headlining, which is always a lot of fun for us because a lot of times when we do the bigger shows, we're opening up for another band. We did with MÖTLEY CRÜE, we did it with DEEP PURPLE. We only play for an hour, it's sort of like, 'Alice Cooper-lite.' You get the hits, but it's not a super-deep dive into the ALICE COOPER band. So, getting to headline and play these big places and do our full, 100-minute show is really fun for us because it really gives us the chance to take the audience on a journey rather than 'Here's a smattering of all the hits, as many hits as we can fit into 50 minutes, then we're out.' This gives us a chance to get deep into the catalog, take our time, tell the whole story and just create a much better experience." ALICE COOPER's summer tour starts on August 3 in Wisconsin and runs through the end of October, including a lengthy section in Canada, from British Columbia across to Ontario. Strauss, who previously played with THE IRON MAIDENS and FEMME FATALE, joined Alice Cooper's band in 2014. This year, she became the first female ever to launch a signature-series Ibanez guitar.